Theorem on parallel lines and plane are explained step-by-step along with the converse of the theorem. Theorem: If two straight lines are parallel and if one of them is perpendicular to a plane, then the other is also perpendicular to the same plane. Let PQ and RS be two parallel straight lines of which PQ is perpendicular to the plane XY. We are to prove that the straight line RS is also perpendicular to the plane XY. Construction: Let us assume straight line PQ and RS intersect the plane XY at Q and S respectively. Join QS. Evidently, QS lies in the XY plane. Now, through S draw ST perpendicular to QS in the XY plane. Then, join QT, PT and PS. Therefore, ∠PST = 1 right angle. i.e., ST is perpendicular to PS. But by construction, ST is perpendicular to QT. Thus, ST is perpendicular to both PS and QS at S. Therefore, ST is perpendicular to the plane PQS, containing the lines PS and QS. Now, S lies in the plane PQS and RS is parallel to PQ; hence, RS lies in the plane of PQ and PS i.e., in the plane PQS. Since ST is perpendicular to the plane PQS at S and RS lies in this plane, hence ST is perpendicular to RS i.e., RS is perpendicular to ST.
Again, PQ and RS are parallel and ∠PQS = 1 right angle. Therefore, ∠RSQ = 1 right angle i.e., RS is perpendicular to QS. Therefore, RS is perpendicular to both QS and ST at S; hence, RS is perpendicular to the plane containing QS and ST i.e., perpendicular to the XY. If two straight line are both perpendicular to a plane then they are parallel. Let two straight lines PQ and RS be both perpendicular to the plane XY. We are to prove that the lines PQ and RS are parallel. Following the same construction as in theorem on parallel lines and plane, it can be proved that ST is perpendicular to PS. Since, RS is perpendicular to the plane XY, hence RS is perpendicular to TS, a line through S in the plane XY i.e., TS is perpendicular to RS. Again, by construction, TS is perpendicular QS. 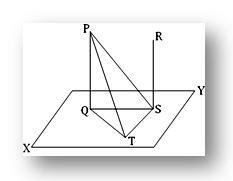 Therefore, TS is perpendicular to each of the straight lines QS, PS and RS at S. hence, QS, PS and RS are co-planar (by theorem on co-planar). Again, PQ, QS and PS are co-planar (Since they lie in the plane of the triangle PQS). Thus, PQ and RS both lie in the plane of PS and QS i.e., PQ and RS are co-planar. ∠PQS = 1 right angle and ∠RSQ = 1 right angle. Therefore, ∠PQS + ∠RSQ = 1 right angle + 1 right angle = 2 right angles. Therefore, PQ is parallel to RS.